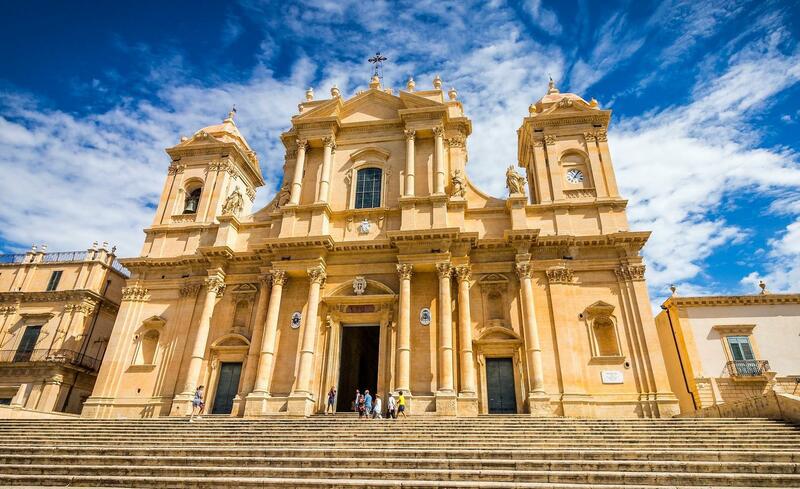 All towns of Southern Sicily feature splendid Baroque buildings, but Noto (25,000 inhabitants) is a real jewel with its more than 30 churches and approx. 40 noble “palazzi” with exuberantly decorated façades, columns and balconies, the beauty of which is stressed by the overall use of the bright-coloured local limestone. The whole townscape, forming a unique “giardino di pietra” (“stone garden”), was rated “World Heritage Site” by Unesco. In fact, old Noto was so severely damaged by the 1693 earthquake that it was decided to abandon the town entirely and build a new one nearer the coast, 16km/10m. away. Present Noto owes its splendour to the plans of the best master-builders of that time, who constructed the new town based on a square grid system of large boulevards lined by prestigious “palazzi” and impressive churches with high columns and great cupolas. Fortunately, the reconstruction of the cupola of the Dome, which tumbled down in 1996, was finished end of 2006, so that visitors can now finally admire its old splendour. At the beginning of May one of the most beautiful streets, Via Nicolai, is completely covered with flowers on the occasion of the “Primavera Baroccai” festival - an event you should not miss when visiting Sicily in this period. And if you like to see more examples of baroque architecture, the towns of Ragusa, Módica and Palazzolo Acréide are all within reach, as well as superb Syracuse with its unique wealth of Greek monuments. A visit to the ruins of the ancient town of Netum (now known as Noto Antica) is also worthwhile. It was inhabited by Siculan settlers and in the seventh century B.C. came under the influence of Syracuse and was fortified by them. A mighty town-gate still reminds Noto’s importance in ancient times. But the valley of Noto also offers a spectacular landscape with lonesome sandy beaches, the marvellous nature reserve “Torre Vendícari” with picturesque remains of the “tonnara” (a relic of former tunny-fishing industry) on the shore, the tiny fishing-village Marzamemi and, at the Southern point of the island, windsurfers’ paradise Capo Passero. By the way, Italy’s best cherry tomatoes come from Pachino, a small town near this cape.